Customer engagement means staying in touch with business and consumer clients on a regular basis. A quick, convenient way to do this is via SBR's cutting-edge e-newsletter content. Besides personalizing customer relationships, our proprietary articles - three to four a month - along with an ad, provide solid opportunities to cross-sell bank products. Delivered straight to your clients' online mailboxes, our e-newsletters will become one of your bank's signature services, without all the work. SBR develops templates, formats and proprietary articles - with topics ranging from loan options to cash flow management - according to your specifications. We can oversee the process from beginning to end, or deliver content for you to manage. It's up to you! 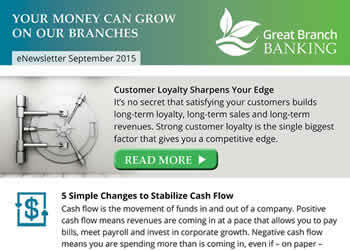 Engage your business customers with industry-related news, bank updates and professional resources. 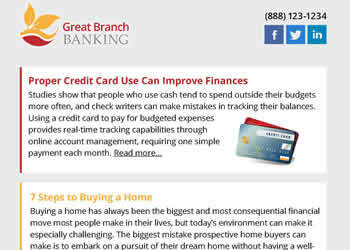 In addition, SBR's proprietary business articles, along with ad placement, are a powerful way to promote bank products. The examples to the right show you why. Today's savvy bank customer wants to know the "why" and "how" of money management. 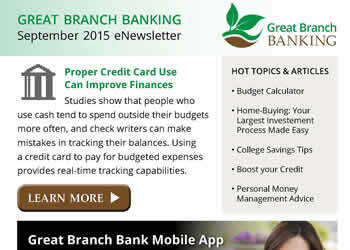 SBR crafts proprietary articles, columns and tips on topics such as saving for college, budgeting and retirement. 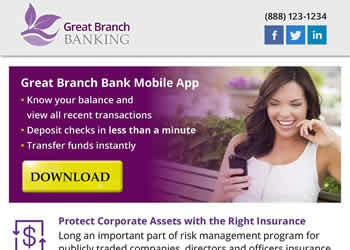 Coupled with the right ad, cross-selling your bank products, while putting a "face" on your bank, can be a snap. See examples to the right.